Should These Media Giants Raise Their Dividends? Will Disney, Fox, and Time Warner raise their underwhelming dividends in the near future? Many media stocks were battered over the past year due to ongoing concerns about cord cutting, falling ad revenues, and soaring budgets for blockbuster movies. Disney (NYSE:DIS) and 21st Century Fox (NASDAQ:FOXA) have dipped more than 10% over the past 12 months, while Time Warner (NYSE:TWX.DL) has fallen nearly 20%. All these stocks underperformed the S&P 500, which declined 1% during that period. Their dividend yields are also fairly low -- Disney and Fox respectively pay forward yields of 1.4% and 1.1%, while Time Warner pays a better yield of 2.2%. Of the three, only Time Warner's dividend beats the S&P 500's average yield of 2.1%, but that percentage was inflated by the stock's steeper decline. Therefore, we should check if these three media giants should raise their dividends to reward patient shareholders. To do so, we can check their payout ratios (the percentage of their free cash flow/earnings spent on dividends), free cash flow growth, and long-term earnings growth. Disney spent 33% of its FCF on dividends over the past 12 months, while Fox spent 31%. Time Warner's FCF payout ratio was slightly lower at 27%, which is interesting because it pays the highest yield. However, Time Warner's quarterly FCF also fell 30% annually last quarter due to higher production costs at Warner Bros, while Disney and Fox's FCF both improved in their most recent quarters. All three companies spend much more money on buybacks than dividends. However, these buybacks aren't paid from their free cash flow -- they're mainly funded by debt, which is cheap right now thanks to low interest rates. On an earnings per share basis, which accounts for those buybacks, Disney spent 25% of its EPS on dividends over the past 12 months. Fox and Time Warner spent 26% and 29% of their respective earnings. Disney and Time Warner have been growing their earnings at a more sustainable rate than Fox, which was spun off from News Corp (NASDAQ:NWSA) in mid-2013. However, Fox has reported its bottom line growth as OIBDA (operating income before depreciation and amortization) since the spinoff to present a clearer picture of the growth of its core businesses. Its OIBDA rose 12% annually last quarter, thanks to the robust growth of its cable and movie businesses. Looking ahead, analysts expect Disney to post 11% annual earnings growth over the next five years. 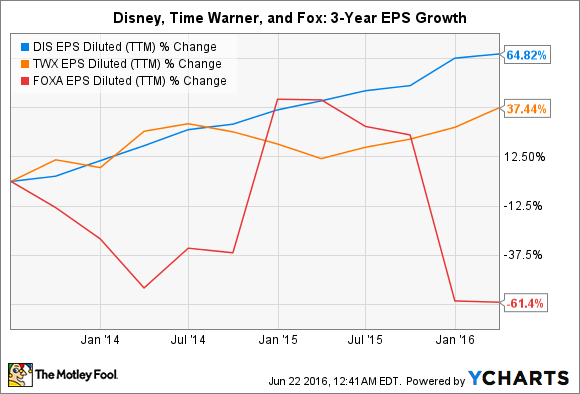 During that period, Fox is expected to post 14% growth while Time Warner's earnings might rise 15%. Those double-digit growth rates indicate that all three companies will continue to raise their dividends. Disney has hiked its dividend annually for six consecutive years. It changed from annual payouts to semiannual ones last year and raised its dividend 19% last December. As I discussed in a previous article, Disney could boost its yield to about 2.5% if it nearly doubled its FCF payout ratio to 60%. But I also noted that would be unlikely, since Disney probably prefers to keep that cash ready to build new park attractions, movies, and shows, or fund future acquisitions. Fox has only raised its dividend once since the spinoff in 2013, and it probably won't raise that payout until its GAAP-adjusted earnings stabilize. Time Warner has raised its payout for seven straight years, with its previous hike boosting its quarterly payout by 15% in February. Disney, Fox, and Time Warner all need cash to continue funding new entertainment projects. Therefore, we can't consider them "mature" income plays like telecom or tobacco plays which have run out of room to expand. I believe that all three companies would be better off reinvesting the money into growing their core businesses instead of simply paying out dividends. All three companies have similar FCF payout ratios near 30%, which can serve as a baseline for "fair" dividends which balance growth and shareholder value. So unless one of these companies generates a lot of free cash which causes that ratio to substantially drop, I don't believe that any dramatic dividend hikes will happen in the near future.